A simple and satisfying weeknight dinner full of flavor, lean protein, vegetables, and noodles. This bowl of noodles is what you want to eat when you’re looking for a fast and cozy dinner. 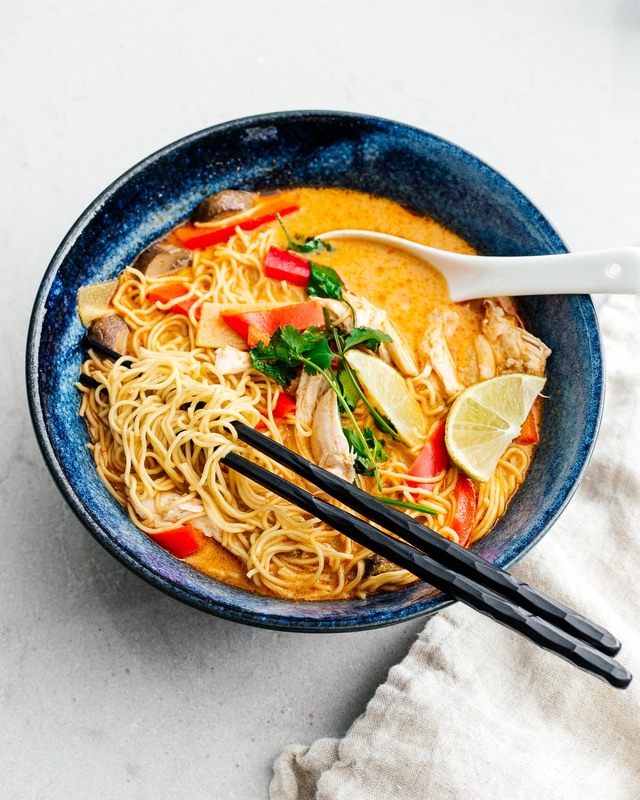 Creamy, spicy, full of vegetables, chicken, and noodles: perfect for warming up and relaxing after a long day in the cold. Do you ever get home from work (or school, or wherever) and are just exhausted? The thought of cooking is absolutely draining and all you want to do is order in? I have to admit, if I were single (thank goodness I’m not), my most used app would probably be grubhub or uber eats (or postmates or doordash). I’m not embarrassed – okay, I’m a little embarrassed – to say that I actually have horrible eating habits. I let myself get incredibly hangry, so much so that I can’t even contemplate cooking. Sometimes, when I’m alone and even waiting for delivery is too much, I’ll eat a family size bag of chips and call it a night. Thankfully we usually have a lot of leftovers in the fridge and that helps, but when there’s nothing in the fridge and I want to make something practically instant, I always think of noodles in soup. I know what you’re thinking? Soup?! That takes forever. I think my noodles in soup habit comes from eating lots and lots of packs of instant noodles in high school. Instant noodles are fast – heck, they’re even called instant! I’ll admit that I still indulge in instant noodles sometimes, but if I’m looking for quick homemade alternative, this is it. Seriously, you just throw everything into your instant pot, wait for it to come to pressure, let it do it’s thing for 5 minutes while you boil and drain some noodles, and you’ve got dinner. This recipe is for two and because there isn’t that much liquid that goes into the pot, it doesn’t even take that long to come to pressure. When the cooking time is done, quick release, take out your chicken and shred it and you’re good to go. Speaking of chicken, I think it’s crazy how all the online Instant Pot chicken breast recipes say that they need to go in at high pressure for 10 minutes. I’ve been cooking chicken breasts at high pressure for 5 minutes and they’ve been coming out great – 10 minutes would definitely be on the dry and stringy side. I think I might even go for 3 or 4 minutes next time. I’ll do it in the spirit of science report back to you if it works. Anyway, I hope you get a chance to try this recipe. It’s a spicy, creamy, nutty, noodle-y bowl of comfort. 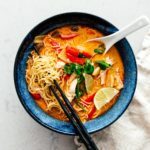 There’s a little bit of spice from the red curry paste, richness from the coconut milk, and a satisfying depth from the sesame. So, so good. 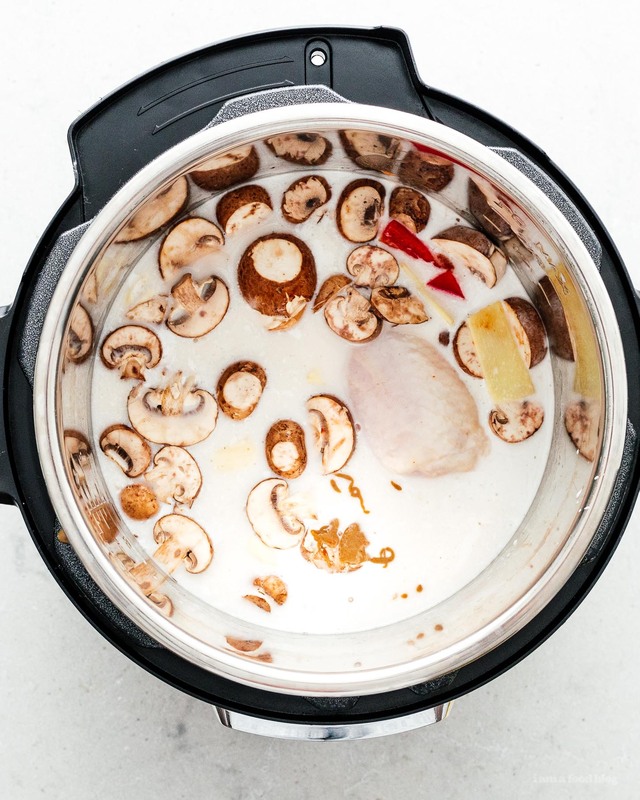 In the Instant Pot insert, add the chicken stock, coconut milk, sesame paste, red curry paste, garlic, ginger, chicken breast, and mushrooms. Cook on high pressure for 5 minutes. While the Instant Pot is doing it’s thing, slice up your peppers and cook and drain your noodles and divide them between two deep bowls. When the Instant Pot is done, quick release the pressure. Carefully remove the chicken and shred. Add the chicken to the bowls with the noodles. Stir the peppers and spinach into the soup. Taste the soup and adjust the seasoning with fish sauce, salt, or even more curry paste if needed, then divide evenly between the two bowls. Finish with lime and cilantro and enjoy! Note: If you don’t have an Instant Pot, you can make it in a regular pot on the stove. 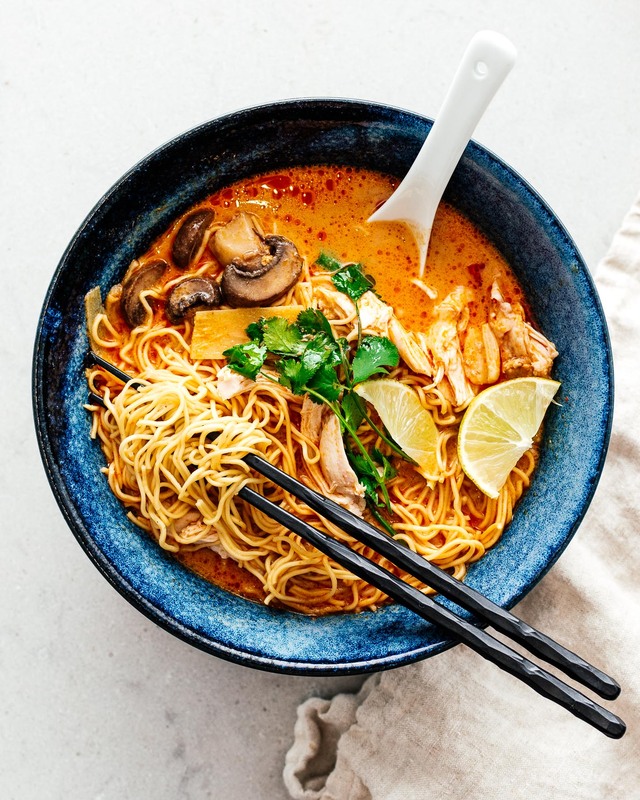 Add the chicken stock, coconut milk, sesame paste, red curry paste, garlic, ginger, chicken breast, and mushrooms to a pot and bring to a simmer over medium heat. Continue to simmer until the chicken is cooked through, about 10-15 minutes, depending on the size of the chicken breast. Continue with the remaining steps. You don’t need an instant pot to make this. 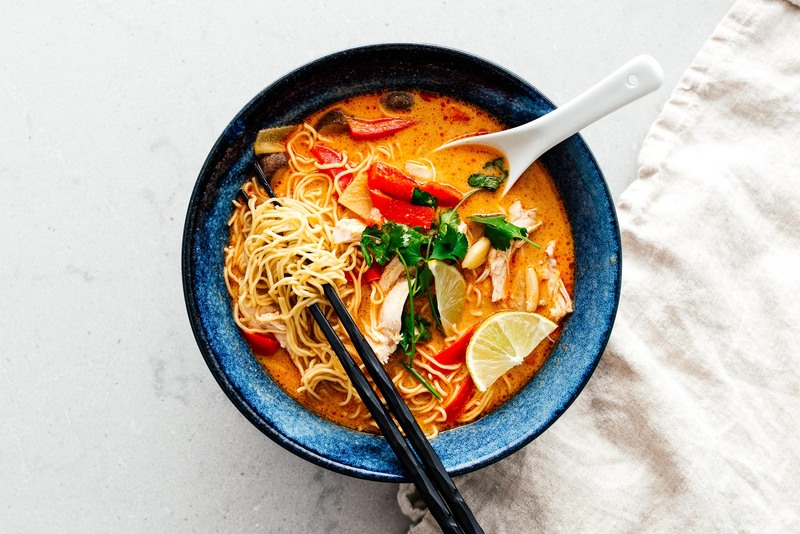 Just use a regular pot for the part that says to use the instant pot and just simmer the ingredients for longer, probably about 10-20 minutes, however long you would normally simmer a soup with chicken. I’m always on a mission to find better ramen noodles. What type do you use? I’ve been able to get a couple of Sun Noodles types, but am not totally convinced that they are the best. I have tried a ton of ones off of some deep dive Amazon shopping, but find those efforts hit or miss. tbh, we’re not huge sun noodle fans ourselves. we usually make our own (recipe here) or we buy locally made from the asian grocery store. I really appreciate your Instant Pot recipes! It’s hard to find recipies for the IP for the type of food I enjoy. You are nailing it! Yum!! What red curry paste do you use?